Asteroid 2015 TB145 (black dot at center) is seen by the European Space Agency's Optical Ground Station at the Teide Observatory in Tenerife, Canary Islands. As you may already know by now, we're going to have a pretty close encounter on Halloween Saturday (Oct. 31) with a pretty big asteroid. The object in question has been cataloged as asteroid 2015 TB145 and was discovered recently – Oct. 10, to be exact – by the University of Hawaii's Panoramic Survey Telescope and Rapid Response System (Pan-STARRS) on Hawaii, part of the NASA-funded Near-Earth Object Observation (NEOO) Program. While most asteroids travel in more-or-less the same orbital plane as the Earth, this one is quite unusual because it is traveling from well south of our orbit and is coming up through our orbital plane at almost the same time that it's making it closest approach to us on Saturday. And yet, because tomorrow is also Halloween, and despite Benner's assurances, there have been many stories tagging this as a "spooky" or "frightening" encounter. I've even seen stories referring to 2015 TB145 as "The Great Pumpkin." And of course, not a few reports talk about the implications of a possible collision with Earth. To repeat NASA's Benner, asteroid 2015 TM145 will not hit Earth tomorrow. 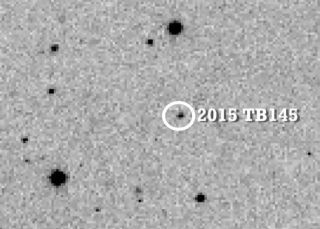 There also have been articles posted about how you can see 2015 TB145 as it streaks past us. But as was the case with Charlie Brown's friend Linus never having actually seen his mythical Great Pumpkin, I'm here to tell most of you reading this that you will not see this big celestial rock with your own eyes as it hurtles past us on Halloween. Saturday, at 10:05 a.m. PT (1:05 p.m. ET), 2015 TB145 will pass about 300,000 miles (480,000 kilometers) from our planet – just 1.3 times the moon's average distance from Earth. In fact, the asteroid will actually get closer to the moon than it will to Earth, passing our nearest neighbor in space at a distance of around 170,000 miles. 2015 TB145 is currently estimated to be about 1,300 feet (400 meters) across. By comparison, the destructive meteoroid that exploded in the sky over Chelyabinsk, Russia, in February 2013 was only about 20 meters wide. Of course, the meteoroid made contact with Earth; 2015 TB145 will not. According to the catalog of near-Earth objects (NEOs) kept by the Minor Planet Center, tomorrow will mark the closest currently known approach by an object this large, until asteroid 1999 AN10, at about 2,600 feet (800 meters) in size, approaches to about 1 lunar distance (238,000 miles from Earth) in August 2027. Now, as to trying to get a look at it, take note that I said that "most of you" will not see it. The operative word here is "most." Indeed, there are some assiduous amateur astronomers who will take the initiative and make the attempt to locate 2015 TB145, either during the predawn hours of Saturday, or soon after darkness falls that evening. But we're talking about experienced observers, with sophisticated equipment and an excellent knowledge of the night sky. Those are the people who will have the best chance of making a sighting. For everyone else … well, it's going to be, in a word, tough. The chief reason that most people will probably never see it is simply because it will be much too faint. Even at its very brightest, the asteroid will be around 10th magnitude, or 40 times fainter than the faintest star that you can see with your unaided eye. And that's when it will be at its very closest to Earth. Now scroll back in this article to where I spoke of the moment when the asteroid will be closest to Earth and you'll notice that this will happen during the daytime hours in North America; when the sky is dark in North America – before dawn Saturday morning or after dusk Saturday – the asteroid will be farther away and likely a magnitude or two fainter; that's about 2.5 to 6.3 times dimmer than at its absolute closest approach. You'll need a moderately large telescope — at the very least 6 to 8 inches of aperture — and a very good star atlas (the popular Norton's Star Atlas won't cut it; you'll need an atlas that goes down to at least 10th magnitude). This graphic depicts the orbit of the Halloween flyby asteroid 2015 TB145, which will come within 300,000 miles (480,000 kilometers) of Earth on Oct. 31, 2015. The asteroid was discovered on Oct. 10. In addition, because 2015 TB145 will be whizzing past us so rapidly, you'll need accurate hour-by-hour positions as it sails through the stars of the constellation Taurus, the Bull, then in between the stars of Gemini and Auriga, then skimming underneath the bowl of the Big Dipper. And it will take only 14 hours to trace that path across that wide expanse of sky. As a final handicap, there's that dark sky nemesis, the moon. Only four days past full phase, it will be a waning gibbous phase, shining brilliantly in Taurus, basically the same region of the sky where the asteroid will begin its rapid sweep across our Earthly line of sight. Of course, professional astronomers will have a field day observing this close encounter. NASA scientists are already visually tracking asteroid 2015 TB145 with several optical observatories In addition, the Deep Space Network's Goldstone 230-foot radar antenna, located in the Mojave Desert, will be employed to bounce radio waves off the asteroid, in an attempt to accurately determine its size. Now, there is one way the average skywatcher may be able to see asteroid 2015 TB145: online. The Slooh Community Observatory will host a free, live webcast of the asteroid flyby tomorrow at 1 p.m. EDT (1700 GMT). You can go to Slooh.com to join and watch this broadcast live, as well as gain access to a vast archive of past shows. Incidentally, after plotting a reliable orbit for 2015 TB145, and then backtracking in time, astronomers discovered that it made a similar close approach to us back in 1975. Of course nothing happened then — we didn't even know it was out there. And nothing will happen Halloween, but at least now you're aware that, unlike The Great Pumpkin, 2015 TB145 indeed exists. You just won't see it.